Optical cables are used for transferring high quality audio signals between two devices via TOSLink connectors. 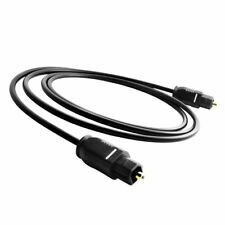 This cable is compatible with any device that has an optical port using a TOSlink connector. PRODUCT DETAILS CE ROHS Certified Fully Approved TosLink Male to 3.5mm Male Digital Optical Plug This high quality fibre optic cable ensures crystal clear digital audio transmissions Fibre optic technology imune from any electrical interference Dust cap protects connector from contamination when not in use Colour: Black 0.8M Cable Length Please note, the 3.5mm Jack plug is an optical jack and cannot be used in standard jack sockets such as headphone jack!. • Connectors: Toslink Male to Male. • Cable Length: 2m. • Use this cable with devices such as Surround sound receivers. • Compatible with ADAT, DAW, Dolby Digital, DTS devices and Tousling devices. • High quality and durable for long life use. 1 x 2m Optical Toslink Cable. Compatible with: ADAT, DAW, Dolby Digital, DTS devices with TosLink interface. This optical cable transfers the audio signal between 2 devices. The cable works with all devices that have optical outputs and inputs and use the TOSlink connector. The cable is also supplied with tip protectors so the polished ends remain polished. This optical cable transfers the audio signal between 2 devices. The cable works with all devices that have optical outputs and inputs and use the TOSlink connector. 0.5m, 1m, 2m, 4m, 6m. The cable is also supplied with tip protectors so the polished ends remain polished. Immune to all Electromagnetic and RF interference. Eliminates distortion caused by inductance,capacitance and resistance found in copper cables. Length : 180 cm. Standard Optical (TOSLINK) to 3.5mm Mini-TOSLINK Adapter. 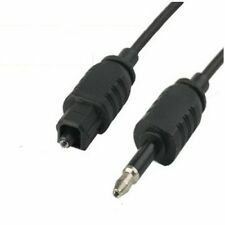 Advisory: This does not do Analogue to Digital conversion, it is only an adapter to downsize an ordinary Optical cable to 3.5mm for dual-port sockets. 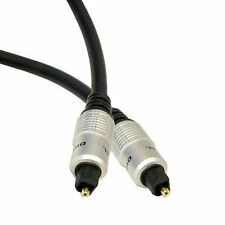 1.5m HQ TOS Link Optical Lead 6mm Cable TOSlink SPDIF 6ft. Compatible with all SPDIF, ADATs, DAW's and Dolby Digital DTS audio devices having the TOSlink Optical interface. Interface: Male to Male Toslink Cable. 5m HQ TOS Link Optical Lead 6mm Cable TOSlink SPDIF 6ft. Compatible with all SPDIF, ADATs, DAW's and Dolby Digital DTS audio devices having the TOSlink Optical interface. Interface: Male to Male Toslink Cable. 1m HQ TOS Link Optical Lead 6mm Cable TOSlink SPDIF 6ft. Compatible with all SPDIF, ADATs, DAW's and Dolby Digital DTS audio devices having the TOSlink Optical interface. Interface: Male to Male Toslink Cable. Fibre optique câble audio (résiste à tout type de perturbation du signal). Robuste nylon tressé Veste pour protéger les lignes de fibre optique sensible. Haute flexibilité (exclusion d'une trop forte pression sur les ports audio numérique optique). CableCreation 25 Feet Toslink Male to Mini Digital S/PDIF Audio Optical Fiber Cable 24K Gold Plated,Black & Silver/7.5M. Cablecreation focuses on the ideal design of all quality cables. 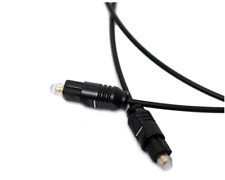 Toslink to Mini 3.5mm Toslink/optical cables used to transmit digital (optical) audio only.,which will NOT convert digital audio signals (optical/Toslink) into analog signals or the other way round. Type de connecteur: SC Male a SC Male Plug. Le cable Toslink, léger et flexible, est constitué d'une couche externe en plastique durable. Il utilise un cable à fibre optique. taille: 1m. 1 cable audio numérique. Le cable à fibres optiques élimine les interférences électromagnétiques (EMI) et les interférences radio (RFI). (Le cable Toslink, léger et flexible, est constitué d'une couche externe en plastique durable. Il utilise un cable à fibre optique. taille: 1m. 1 cable audio numérique). Le cable à fibres optiques élimine les interférences électromagnétiques (EMI) et les interférences radio (RFI).